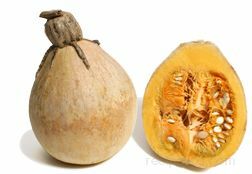 A member of the pumpkin family, this vegetable is a thick-skinned pumpkin-shaped squash that ranges in diameter from 8 to 12 inches with an average weight of 3 to 4 pounds. Inside the hard deep green or redish-orange, spotted outer skin there is a semi-firm, dense golden flesh that has a rich, sweet flavor. With a flavor that tastes similar to pumpkin meat or a sweet potato, it is a good substitute for recipes requiring pumpkin or sweet potatoes as ingredients. 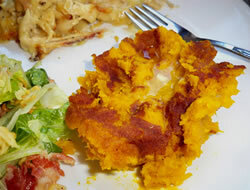 When cooked its texture resembles that of a tender potato. 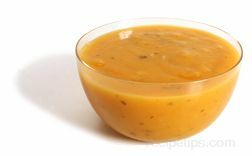 It can be baked, braised, pureed, stuffed, or steamed to be served as a side dish or as a base for soups, cakes, and pies. 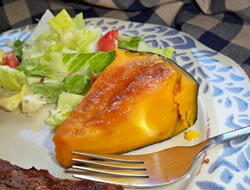 This squash can be baked whole or in halves. To bake whole, pierce the skin with a fork several times and place in a low baking pan with water. To bake one half, cut the squash lengthwise and remove the seeds. The half section can then be placed on a baking pan with the outer skin placed down on the baking pan. When selecting a Kabocha squash, which is generally available all year round, do not select those that have a tender skin or show pitting. The outer skin should be hard with a stem that is intact and looks fresh. Store up to one month in a cool dry location with good air circulation. When cut open, the fresh sections of squash can be stored in plastic wrap and refrigerated for a week or less. 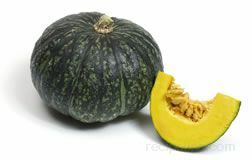 Kabocha squash are also known as Delica, Ebisu, Kobacha, Japanese Pumpkin, Japanese squash, and Hoka squash.